Those who know me well, know that any spare time I have (yeah right!) is often spent behind my camera lens. My third child SLR is attached to my hip like a baby to it’s mom. It captures the grazed knees, the babycino moustaches, the changing colours of the seasons and lately, moving images of my kids as I play around with making video time capsules. I am so grateful for my love of photography as it allows me the opportunity to capture precious moments forever. I spend many hours scrolling through these memories and I hope one day my fairy and monkey will too. These school holidays, my camera travelled by plane and car. It accompanied us to Terrigal where I spent a few days with the kids and my parents. Though for once, my extra appendage barely mad it out the bag. 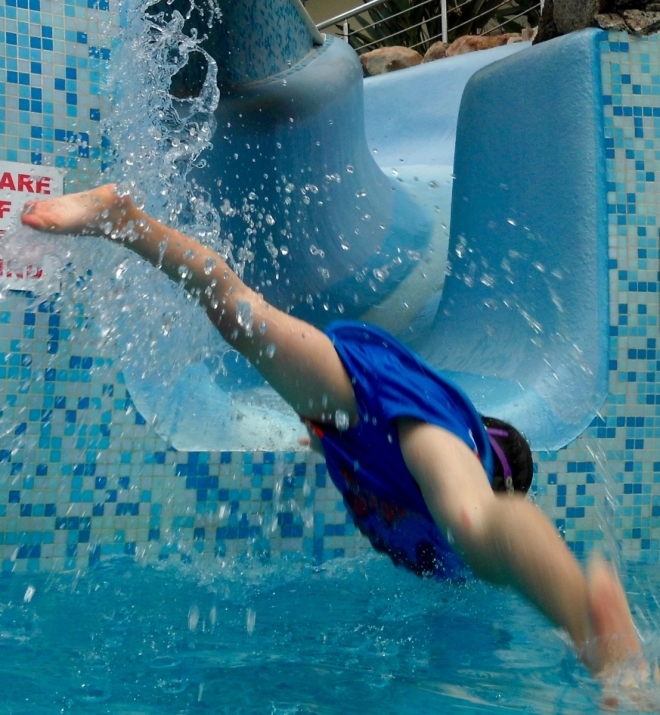 The only photo I took was this one of my fearless little monkey flying through the air is he came screaming down the water slide. I decided, admittedly inadvertently, to spend the holidays without my camera. Instead, I used two hands to help the kids build sand castles, I lay very still, with my arms wrapped around two small warm bodies….as I cherished the early morning cuddles in bed with nowhere to go and the darkness enveloping the three of us. I played countless games of Zingo, Boggle Junior and hide and seek. And as the days went by, I realised I was building up a photo library filled with hundreds of images in my memory. This was a holiday where time went slowly. Where I walked holding two little hands instead of a camera strap. I have no doubt that very soon my hip extension will be back accompanying us to the park, parties and bike rides. But there was something very special and sacred about watching it all, taking it all in and trying as hard as possible to photograph each moment in my mind….so that when the fairy has flown off and the monkey outgrows his mom peeling his bananas for him, I will recall these days of being fully present in human form only.